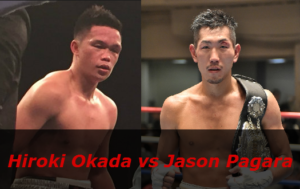 December 19 at the Korakuen Hall — Tokyo, Japan, a fight took place among the boxers in the 1-m welterweight (up to 63.5 kg) — Hiroki Okada against Jason Pagara. Hiroki Okada vs Jason Pagara. The percentage of early wins Hiroki Okada KOs 54%. The percentage of early wins Jason Pagara KOs 58%. The fight for the title of champion of the Asia-Pacific region by Vacant WBO Asia Pacific in the 1-m welterweight. Jason Pagara is a Filipino professional boxer. He was a Junior Welterweight WBO international champion in 2011. Win to TKO 6 for Hiroki Okada — Won vacant WBO Asia Pacific Super Lightweight Title.